Spring Fever Package! April 1-30, 2019! One night plus 10% off dining at the Stone House and bottle of Champagne! Starts at $73! Book Online Here! Lodging fit for a King. We have rooms to fit any taste. Historic and elegant or modern and romantic, find the perfect place to rest your weary bones from travelling the Ohiopyle area. Whether you're looking for unique drinks and great times, or a historical dining experience with great food and service, you'll find everything you could ask for here. 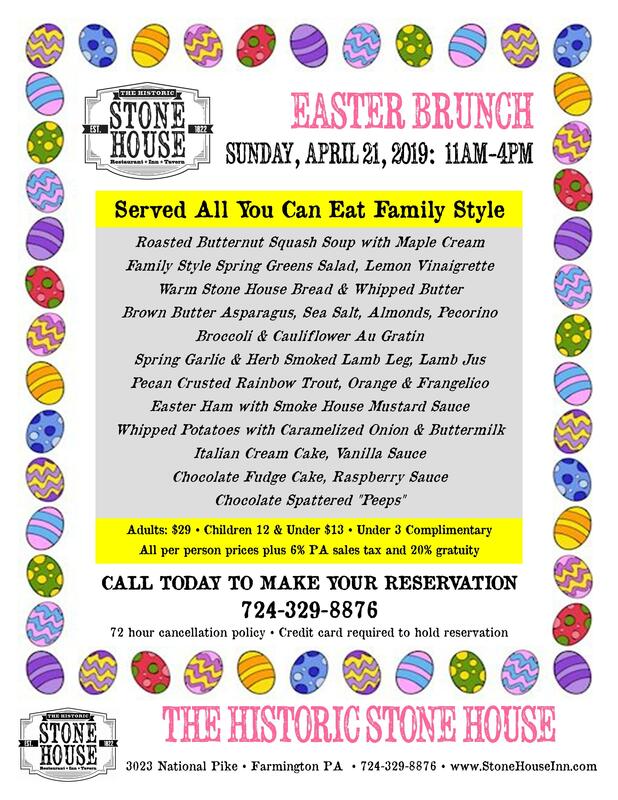 From backyard to black tie, The Historic Stone House is the premier caterer throughout the Tri-State Area of Pennsylvania, Maryland & West Virginia. Whether you are planning a small affair or a grand one, our expert staff is here to help you plan the perfect event. From choosing the ideal venue to creating a most fabulous menu and all the little details in between...we will do all we can to assure your event is a success. “We had our wedding there this past July and could not have asked for a better experience.The Stone House Inn has been a very active part in our lives. One of our first dates was to the Stone House, our engagement lunch was at the Stone House. Then when we started to discuss our wedding there was never a second thought as to where we would have our reception. Every staff member went out of their way to make me feel at home from coming early to staying around to make sure I had everything loaded into the needed vehicles. Christine was my buddy through it all and even now. With making suggestions to helping make our decisions come to life. She was outstanding. She thought of things for me before I realized I would need them.I wanted for nothing the day of our wedding and it made for a enjoyable and relaxing day. Christine helped with even the smallest of details. Making sure I got a chance to have a small snack before I went downstairs to the reception area, to as you can see from the photos helping me fluff out my wedding gown before our entrance to the reception. The Stone House Inn arranged for our guests to have the meal that we had at the Stone House the day of our engagement, the fried chicken dinner. Our guests have done nothing but rave about the meal and quality of food. We had a wonderful afternoon! We can't wait to come back and visit as usual, only this time as a newly married couple. "Christine, I can't believe how fast a year and half of wedding planning flew by.. When we met you in January 2017, Jason and Mercedes had been planning a beach wedding that turned into a nightmare. From the minute we walked into the Stone House to talk with you, you put their mind at ease. You were and still are a true blessing. Every little detail of their day you made possible. You took the stress out of planning and the suggestions of different vendors were phenomenal. You are every bit the Professional in Event Planning. You made the week leading up to and the weekend of their wedding totally stress free. Allowing us to deliver the wedding cookies early, to overseeing the plating of them yourself, the personal detail was awesome. The Stone House Staff is superior. Everyone was friendly and accommodating. Everything we needed was provided. Choosing to have the Rehearsal Dinner there was the very best choice. The Brides, Boots and BBQ was delicious. You even started through a back up plan if it were to rain and we couldn't use the gazebo... Always thinking of the what if's really helped to calm nerves. Christine, you really did become part of the family. You were there bight and early the day of the wedding. From checking on Mercedes and Jason to keeping the Groomsman in check, you were so calm and reassuring. You went above and beyond. We felt as if we were catered too. The reception was beautiful. The dinner of Chicken Parm and Steak was extraordinary. All of the guests we have talked to since have remarked about how delicious the food was and loved being served. Even throughout the night you and your staff were there for any and everything. Inspired by Chef Critchfield’s desire to bring the mountain residents a family owned old fashioned meat market centered on quality and convenience. • Local Produce, Jams, Eggs & More! Last Beer Dinner of this series features PLATFORM on Friday, 4/26/19 at the Stone House! Inn room special for beer dinners - attend the dinner and get Inn room for just $50! Book today - 724-329-8876! These have been selling out, plan ahead! Sign up with your email address to receive news and updates about our events and specials.